In the movie Forrest Gump, there is a scene where Captain Dan (played by Gary Sinise) has reached his wits end. His life didn’t pan out as he expected, he felt he had a destiny, but instead, his journey took a different course. For years, he fought it, bitter. When he reaches rock bottom, he is in the middle of a hurricane stuck out at sea on a boat. He climbs to the top of the mast, and challenges mother nature. For years, he rejected his journey, but suddenly, he is full of drive. He survives the storm, and it becomes a catalyst for him to accept how things are, not how he expected them to be. And he moves on, building a fruitful life with what he has. In the end, he becomes wealthy, finds love, and even overcomes a disability. I know that there are many in publishing who are working towards change, who are experimenting with new formats, new products, and new ways of relating to their audience. But often, those people don’t get the support that is required to really turn the ship. They do great things with very few resources, but progress is slow. The problem with eeking along on one’s journey reluctantly is that it focuses on the wrong things. The hero’s journey is less about the destination, than the journey itself. What we learn about ourselves, those around us, and the larger context of the world we live in. What if Frodo never left The Shire? What if Dorothy never left Kansas? What if Luke never left Tattooine? And if you think these are just fictional stories that don’t relate to the real-world challenges of shifting an industry the size of publishing, then consider: What if Steve Jobs sat home and counted his millions when he was fired from Apple in 1985, and never continued on his journey? What if Jeff Bezos never got in that car to Seattle, writing Amazon.com’s business plan on the way? Be wary of the excuse of protecting existing business models. Because that can prevent a business from understanding their audience, and the scope of the world around them. It can prevent them from uncovering real value, real solutions, and real meaning in their industry. Every week, I get to meet smart passionate people who work in publishing and media. People who are looking to the future, and appreciating the amazing things that are happening in the present. Some publishers have the vision. Some publishers have been experimenting with new media. In some ways, nearly all publishers are ‘working on it,’ trying to evolve carefully. But the future is coming, quickly. Your audience is changing their behaviors, quickly. And new competitors are encroaching, quickly. When considering your future, and the journey you are on, consider: If not now, when? 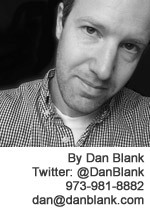 Let me know if I can help you as you make your way down that road: @DanBlank, 973-981-8882 or dan@danblank.com.